The finest from the cross. 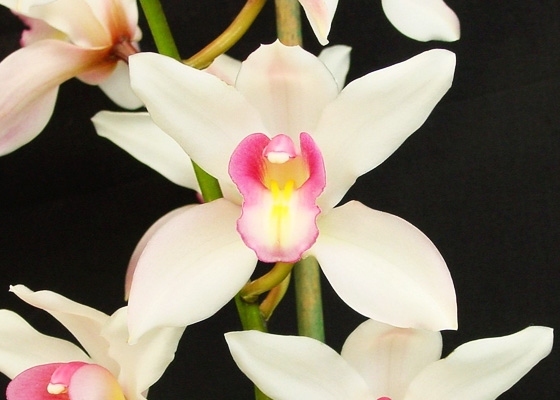 The sepals and petals are cream-white, opening slightly green and brightening with maturity. The pink lip has dark, fine picotee edging, and the mid lobe and keel are bright yellow. The delicate flowers are held high above the foliage. Very free flowering and long lasting; often blooming for over 2 months. From the cross of Cymbidium insigne subsp. seidenfadenii and Cymbidium Trigo Royal. .Cool growing. November - December blooming.